the site of the junction or union of two or more bones of the body; its primary function is to provide motion and flexibility to the frame of the body. Some are immovable, such as the sutures where segments of bone are fused together in the skull. Others, such as those between the vertebrae, are gliding joints and have limited motion. However, most joints allow considerable motion. The most common type are the synovial joints, which have a complex internal structure, composed not only of ends of bones but also of ligaments, cartilage, the articular capsule, the synovial membrane, and sometimes bursae. acromioclavicular joint the point at which the clavicle joins with the acromion. ankle joint the joint between the foot and the leg; see ankle. 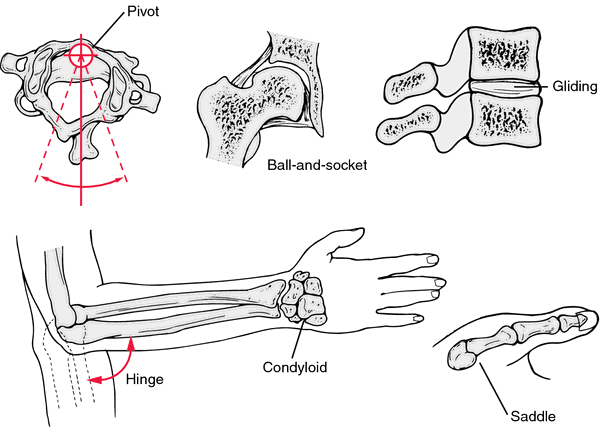 ball-and-socket joint a synovial joint in which the rounded or spheroidal surface of one bone (the “ball”) moves within a cup-shaped depression (the “socket”) on another bone, allowing greater freedom of movement than any other type of joint. See illustration. Called also polyaxial or spheroidal joint. bicondylar joint a condylar joint with a meniscus between the articular surfaces, as in the temporomandibular joint. cartilaginous joint a type of synarthrosis in which the bones are united by cartilage, providing slight flexible movement; the two types are synchondrosis and symphysis. composite joint (compound joint) a type of synovial joint in which more than two bones are involved. 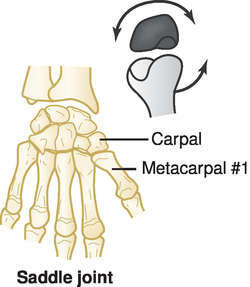 condylar joint (condyloid joint) one in which an ovoid head of one bone moves in an elliptical cavity of another, permitting all movements except axial rotation; this type is found at the wrist, connecting the radius and carpal bones, and at the base of the index finger. See illustration. elbow joint the synovial joint between the humerus, ulna, and radius. See also elbow. facet j's the articulations of the vertebral column. fibrous joint a joint in which the union of bony elements is by continuous intervening fibrous tissue, which makes little motion possible; the three types are suture, syndesmosis, and gomphosis. Called also immovable or synarthrodial joint and synarthrosis. flail joint an unusually mobile joint, such as results when joint resection is done to relieve pain. glenohumeral joint the synovial joint formed by the head of the humerus and the glenoid cavity of the scapula. Called also humeral joint and shoulder joint. gliding joint a synovial joint in which the opposed surfaces are flat or only slightly curved, so that the bones slide against each other in a simple and limited way. The intervertebral joints are this type, and many of the small bones of the wrist and ankle also meet in gliding joints. Called also arthrodial joint and plane joint. hinge joint a synovial joint that allows movement in only one plane, forward and backward. Examples are the elbow and the interphalangeal joints of the fingers. The jaw is primarily a hinge joint but it can also move somewhat from side to side. The knee and ankle joints are hinge joints that also allow some rotary movement. See illustration. Called also ginglymus. hip joint the synovial joint formed at the head of the femur and the acetabulum of the hip. See illustration at hip. knee joint the compound joint between the femur, patella, and tibia. pivot joint a synovial joint in which one bone pivots within a bony or an osseoligamentous ring, allowing only rotary movement; an example is the joint between the first and second cervical vertebrae (the atlas and axis). See illustration. Called also rotary or trochoid joint. sacroiliac joint the joint between the sacrum and ilium in the lower back; see also sacroiliac joint. saddle joint a synovial joint whose movement resembles that of a rider on horseback, who can shift in several directions at will; there is a saddle joint at the base of the thumb, so that the thumb is more flexible and complex than the other fingers but is also more difficult to treat if injured. simple joint a type of synovial joint in which only two bones are involved. synovial joint a specialized joint that permits more or less free movement, the union of the bony elements being surrounded by an articular capsule enclosing a cavity lined by synovial membrane. Called also articulation and diarthrosis. A capillary network in the synovial membrane provides nutrients and synovial fluid to nourish and lubricate the joint space. Strong fibrous bands or cords (ligaments) give strength and security to synovial joints. The majority of the body's joints are of this type. They are divided into five types according to structure and motion: ball and socket, gliding, saddle, hinge, and pivot. temporomandibular joint (TMJ) a bicondylar joint formed by the head of the mandible and the mandibular fossa, and the articular tubercle of the temporal bone. See also temporomandibular joint disorder. (joint) the site of junction or union between bones, especially one that allows motion of the bones. Various kinds of joints. Fibrous: A, syndesmosis (tibiofibular); B, suture (skull). Cartilaginous: C, symphysis (vertebral bodies); D, synchondrosis (first rib and sternum). Synovial: E, condyloid (wrist); F, gliding (radioulnar); G, hinge or ginglymus (elbow); H, ball and socket (hip); I, saddle (carpometacarpal of thumb); J, pivot (atlantoaxial). biaxial joint one with two chief axes of movement, at right angles to each other. bicondylar joint a condylar joint with a meniscus between the articular surfaces, such as the temporomandibular joint. bilocular joint one with two synovial compartments separated by an interarticular cartilage. cartilaginous joint a type of synarthrosis in which the bones are united by cartilage. Chopart's joint one between the calcaneus and the cuboid bone and the talus and navicular bone. cochlear joint a hinge joint that permits some rotation or lateral motion. composite joint , compound joint one in which several bones articulate. condylar joint , condyloid joint ellipsoidal joint; one in which an ovoid head of one bone moves in an elliptical cavity of another, permitting all movements except axial rotation. elbow joint the articulation between the humerus, ulna, and radius. facet joints the articulations of the vertebral column. fibrous joint a type of synarthrosis in which the bones are united by continuous intervening fibrous tissue. flail joint an unusually mobile joint. hip joint the spheroidal joint between the head of the femur and the acetabulum of the hip bone. intercarpal joints the articulations between the carpal bones. Lisfranc's joint the articulation between the tarsal and metatarsal bones. mixed joint one combining features of different types of joints. neurocentral joint a synchondrosis between the body of a vertebra and either half of the vertebral arch. 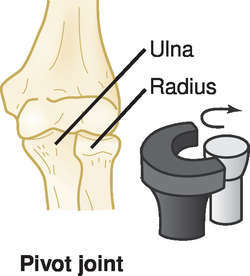 pivot joint a uniaxial joint in which one bone pivots within a bony or an osseoligamentous ring. 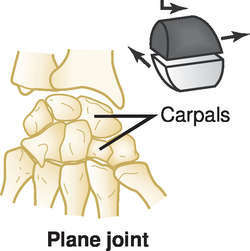 plane joint a synovial joint in which the opposed surfaces are flat or only slightly curved. saddle joint one having two saddle-shaped surfaces at right angles to each other. simple joint one in which only two bones articulate. spheroidal joint ball-and-socket joint; a synovial joint in which a round surface on one bone (“ball”) moves within a concavity (“socket”) on the other bone. synovial joint diarthrosis; a joint that permits more or less free motion, the union of the bony elements being surrounded by an articular capsule enclosing a cavity lined by synovial membrane. temporomandibular joint a bicondylar joint formed by the head of the mandible and the mandibular fossa, and the articular tubercle of the temporal bone. uniaxial joint one which permits movement in one axis only. unilocular joint a synovial joint having only one cavity. a. A place or part at which two or more things are joined. b. A way in which two or more things are joined: a mortise-and-tenon joint. a. A point of articulation between two or more bones, especially such a connection that allows motion. b. A point in the exoskeleton of an invertebrate at which movable parts join, as along the leg of an arthropod. 3. Botany An articulation on a fruit or stem, such as the node of a grass stem. 4. Slang A marijuana cigarette. 1. Shared by or common to two or more: our joint presence; a joint income-tax return. 2. Sharing with another or others: a joint tenant. 3. Formed or characterized by cooperation or united action: joint military maneuvers. 4. Involving both houses of a legislature: a joint session of Congress. 5. Law Regarded as one, especially with regard to tort liability or interest in property. 6. Mathematics Involving two or more variables. 1. To combine or attach with a joint or joints: securely jointed the sides of the drawer. 2. To provide or construct with joints: joint a boom on a crane. 3. To separate (meat) at the joints. any one of the articulations between bones. Each is classified according to structure and movability as fibrous, cartilaginous, or synovial. Fibrous joints are immovable, cartilaginous joints are slightly movable, and synovial joints are freely movable. Typical immovable joints are those connecting most of the bones of the skull with a sutural ligament. Typical slightly movable joints are those connecting the vertebrae and the pubic bones. Most of the joints in the body are freely movable and allow gliding, circumduction, rotation, and angular movement. Also called articulation. See also cartilaginous joint, fibrous joint, synovial joint. Substance abuse A popular term for a cigarette made from dried marijuana, Cannibas sativa leaves, which is 'toked' to produce a 'high' and, if smoked in excess, 'get stoned'. See Hallucinogen, Marijuana, Substance abuse, THC receptor. ANATOMY The place of union, usually more or less movable, between two or more bones. Joints between skeletal elements exhibit a great variety of form and function, and are classified into three general morphologic types: fibrous joints; cartilaginous joints; and synovial joints. Synonym(s): arthrosis (1) , articulation (1) , junctura (1) . Joints are also grouped according to their motion: ball and socket (enarthrodial); hinge (ginglymoid); condyloid; pivot (trochoid); gliding (arthrodial); and saddle joint. Joints can move in four ways: gliding, in which one bony surface glides on another without angular or rotatory movement; angulation, occurring only between long bones, increasing or decreasing the angle between the bones; circumduction, occurring in joints composed of the head of a bone and an articular cavity, the long bone describing a series of circles, the whole forming a cone; and rotation, in which a bone moves about a central axis without moving from this axis. Angular movement, if it occurs forward or backward, is called flexion or extension, respectively; away from the body, abduction; and toward the median plane of the body, adduction. Because of their location and constant use, joints are prone to stress, injury, and inflammation. The main diseases affecting the joints are rheumatic fever, rheumatoid arthritis, osteoarthritis, and gout. Injuries comprise contusions, sprains, dislocations, and penetrating wounds. A gliding or plane joint between the acromion and the acromial end of the clavicle. A joint that is both ginglymoid and arthrodial. A joint with two chief movement axes at right angles to each other. A joint separated into two sections by interarticular cartilage. A joint with cartilage between the bones. A joint made up of several bones. A joint permitting all forms of angular movement except axial rotation. The sound produced by forcible movement of a joint by contracting the muscles that contract or extend a joint, esp. 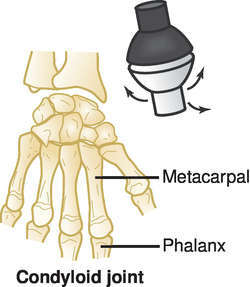 the metacarpophalangeal joints. The cause is not known. Either of the encapsulated, double synovial joints between the condylar processes of the mandible and the temporal bones of the cranium. The double synovial joints are separated by an articular disk and function as an upper gliding joint and a lower modified hinge or ginglymoid joint. A joint characterized by the presence of a cavity within the capsule separating the bones, permitting considerable freedom of movement. Arthritis of the chronic villous type. 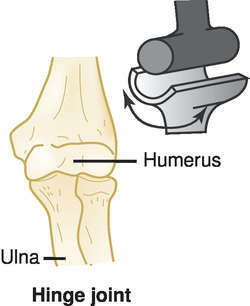 The hinge joint between the humerus and the ulna. A joint with two axes of motion through the same bone. Any of the zygapophyseal joints of the vertebral column between the articulating facets of each pair of vertebrae. A false joint formation after a fracture. Any of the joints connected by fibrous tissue. A joint that is extremely relaxed, the distal portion of the limb being almost beyond the control of the will. a synovial joint in which two bones flex and extend in only one plane, usually because side (collateral) ligaments limit the direction of motion, e.g., elbow joint. A synovial ball-and-socket joint in which the head of the femur fits into the acetabulum of the hip bone. More than seven separate ligaments hold the joint together and restrict its movements. Any of the articulations formed by the carpal bones in relation to one another. A recurrent joint inflammation of unknown cause. The joint formed by the femur, patella, and tibia. A joint separating the navicular, lunate, and triangular bones from the distal row of carpal bones. A slightly movable or freely movable joint, amphiarthrodial and diarthrodial, respectively. A synovial joint between bone surfaces, in which only gliding movements are possible. A technique for minimizing stress on joints, including proper body mechanics and the avoidance of continuous weight-bearing or deforming postures. The articulation between the sacrum and the ilium of the hip bone. Joint movement is limited because of interlocking of the articular surfaces. 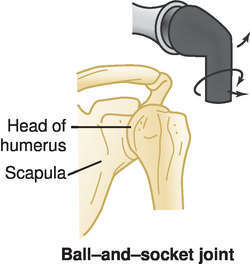 The ball-and-socket joint between the head of the humerus and the glenoid cavity of the scapula. A joint composed of two bones. A multiaxial joint with spheroid surfaces. The joint space between the sternum and the medial extremity of the clavicle. A joint with reduced mobility. Any of the three articular surfaces on the inferior surface of the talus. An articulation between two cranial or facial bones. A joint in which the articulating surfaces are separated by synovial fluid. A joint composed of three arthrodial joints, the bones of which articulate with the bases of the metatarsal bones. The functional articulation of the distal ulna, articular disk, and triquetrum. The disk may subluxate following injury or with arthritis and block supination of the forearm. A joint moving on a single axis. A joint with a single cavity. a contact between two separate bones. There are various types in humans: hinge, e.g. knee, elbow, fingers; ball and socket, e.g. hip; universal, e.g. atlas vertebra; sliding/gliding, e.g. wrist; fixed, e.g. skull sutures; slightly movable: vertebrae. The point where bones meet. Arthroscopic surgery is used on joint problems. Articular surfaces Minor incongruence between articular surfaces within a synovial joint causes large changes in forces acting at different parts of articular surface, e.g. n a point of articulation between bones. n two-layered structure that surrounds, supports, and lubricates synovial joints. n a neutral positioning of a joint by which maximum equilibrium exists between the surfaces and the tension or length relationships of antagonist muscles are stabilized. n pressure receptors in the capsules of joints. They are sensitive to the motion, acceleration, and deceleration of the joint. n the complete range of motion measured with a tape measure or a goniometer. In most cases, a practitioner determines the range by visual examination. n the pelvic joint which connects the sacrum and the ilium. It is supported by the hamstring muscles and can be adversely affected by weaknesses or dysfunction in them. anatomy Place of union, usually more or less movable, between two or more rigid skeletal components (bones, cartilage, or parts of a single bone). Joints between skeletal elements exhibit a great variety of form and function and are classified into three general morphologic types: fibrous, cartilaginous, and synovial. n the junction of union between two or more bones or cartilages of the skeleton. n a manifestation of late syphilis in which there is degeneration, hypertrophy, hypermobility, and loss of contour of a joint, usually a weight-bearing joint. It is most common in tabes dorsalis. n a joint that moves freely in contact. 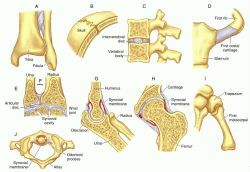 The adjacent bone surfaces are typically covered by a film of cartilage and are bound by stout connective tissues, frequently enclosing a liquid-filled joint cavity. n an inflammatory, infectious, or functional disorder within a joint. n cartilaginous material present in the synovial spaces of a joint. the site of the junction or union of two or more bones of the body. See also arthritis. The primary functions of joints are to provide motion and flexibility to the skeletal frame, or to allow growth. Some joints are immovable, such as certain fixed joints where segments of bone are fused together in the skull. Other joints, such as those between the vertebrae, have extremely limited motion. However, most joints allow considerable motion. Many joints have a complex internal structure. They are composed not merely of ends of bones but also of ligaments, which are tough whitish fibers binding the bones together; cartilage, which is connective tissue, covering and cushioning the bone ends; the articular capsule, a fibrous tissue that encloses the ends of the bones; and the synovial membrane, which lines the capsule and secretes a lubricating fluid (synovia). Joints are classified by variations in structure that make different kinds of movement possible. The movable joints are usually subdivided into hinge, pivot, gliding, ball-and-socket, condyloid and saddle joints. For a complete named list of joints in the body see Table 11.
a synovial joint in which the rounded or spheroidal surface of one bone ('ball') moves within a cup-shaped depression ('socket') on another bone, allowing greater freedom of movement than any other type of joint. Called also spheroidal joint. permits movement around two axes. one in which the bones are united by cartilage, providing either slight flexible movement or allowing growth; it includes symphyses and synchondroses. one in which an ovoid head of one bone moves in an elliptical cavity of another, permitting all movements except axial rotation. Called also condylar joint. see articular rigidity, joint hypermobility, arthrogryposis, contracture. a disease of the joints of all species and all ages but reaching a particularly high prevalence in pen-fed young bulls in which it is characterized by the sudden onset of lameness in a hindlimb, with pain and crepitus in the hip joint and rapid wasting of the muscles of the croup and thigh. There is a family predisposition to this degenerative arthropathy; it is exacerbated by a diet high in phosphorus and low in calcium and dense in energy so that the bull has a high body weight and is growing fast. The onset is acute and often precipitated by fighting or mating. The disease may not develop until 3 or 4 years of age in bulls that are reared at pasture. Called also coxofemoral arthropathy. See also hip dysplasia. see arthritis, arthropathy, joint-ill, ankylosis, articular rigidity. circumference of the joint is an ellipse with the articular surfaces longer in one direction than the other. the synovial joints of the vertebral column between the neural arches. a combination of fibrous and cartilaginous joints. Called also amphiarthrosis. Movement limited and variable. one in which the bones are connected by fibrous tissue; it includes suture, syndesmosis and gomphosis. includes ankylosis, tendon contracture, arthrogryposis. a synovial joint in which the opposed surfaces are flat or only slightly curved, so that the bones slide against each other in a simple and limited way. The synovial intervertebral joints are gliding joints, and many of the small bones of the carpus and tarsus meet in gliding joints. Called also arthrodial joint and plane joint. a synovial joint that allows movement in only one plane, through the presence of a pair of collateral ligaments that run on either side of the joint. Examples are the elbow and the interphalangeal joints of the digits. The jaw is primarily a hinge joint, but it can also move somewhat from side to side. The carpal and tarsal joints are hinge joints that also allow some rotary movement. Called also ginglymus. the joint between the head of the femur and the acetabulum of the hip bone; loosely called hip. joint can be extended beyond the normal position. usually a congenital defect with all joints affected. Degree varies from extreme, in which limbs can be tied in knots and animal unable to stand, to mild, in which the patient is able to walk but the gait is abnormal. There may be additional defects such as pink teeth lacking enamel and dermatosparaxis (hyperelastosis cutis). See also hereditary collagen dysplasia. 1. the joint between the femur and tibia, fibula and patella. 2. in large ungulates the compound joint between the radius, ulna, carpus and metacarpus. fragments of cartilage or bone that lie free in the joint space. See also joint mouse. inflexible joint composed of bone; called also synostosis. a joint in which one bone pivots within a bony or an osseoligamentous ring, allowing only rotary movement; an example is the joint between the first and second cervical vertebrae (the atlas and axis). sensory nerve endings capable of detecting the position or angle of the joint. the articulating surfaces are reciprocally saddle-shaped and permit movement of all kinds, though not rotation, e.g. interphalangeal joints in the dog. a specialized form of articulation permitting more or less free movement, the union of the bony elements being surrounded by an articular capsule enclosing a cavity lined by synovial membrane. Called also diarthrosis and diarthrodial joint. permits movement in one direction only. Q. I’ve been having joint pain for the last two months or so, do I have arthritis? I’m a 32 year old dancer, and those pain affects my work and my life.. What can it be and what can I do with it? Is there a way to ease the pain? A. As a former gymnast and international coach(German Olympic Team) I was having severe pain, Turns out I have fibromialgia ,MS and cronic fatigue. I have a pain combination that includes an anti dpressant(light)Opana,and a parkinsons med as well as a breakthrough pain med.... works and so can I,limited but almost pain free. Q. Past few months from now my mom is facing a severe pain in the joints of her ankle.not even able to walk now Hi All, Something happened like this my mom was attacked by sever cough and an x-ray was taken and Doctors confirmed that there was some infection in lugs and it got cured.Later she got fever and after few days wen fever went off she found it difficult to move bcz of swelling in her ankle and tightened joints,large pain when tried to walk and a bit of swellin in figures too.Am very much confused abt wat this disease is and y is this happened suddenly. Is der any disease vch can bring down the mobility in one week. Doctors at my place are completely ignorant abt such situation and are claiming this can not be cured and should be faced through out the life. I took my mom to a good city hospital and Doctors here have categorized it as Rheumatoid arithritis. Am really worried and completely ignorant abt this Kindly help me. A. If it started after lung infection, than the joint pain may represent "reactive arthritis" after pneumonia due to Chlamydophila (a bacteria that cause inflammation of the joints after it cause lung infection). However, it's only a suggestion - you may want to consult someone more professional.